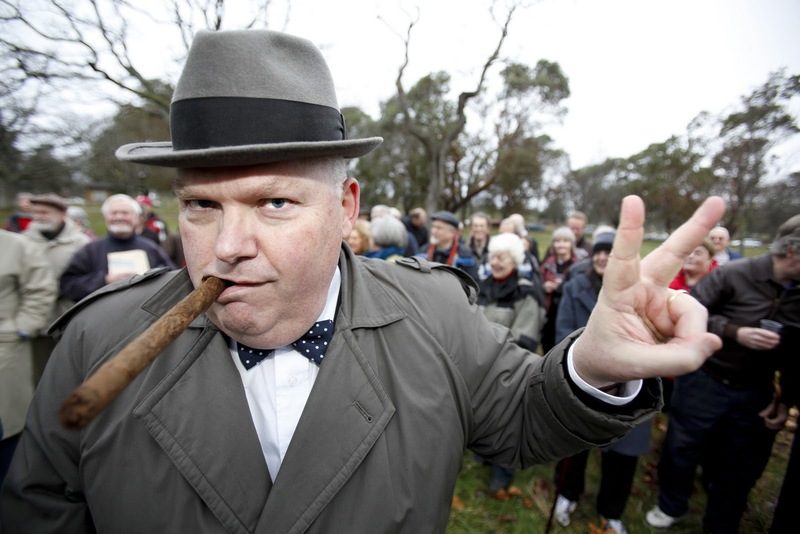 Victoria author Chris Gainor reprises his role as Winston Churchill for annual commemoration at Beacon Hill Park, where Churchill planted a hawthorn during a visit in 1929. Deddeda Stemler photograph. The men hauled fish from a bountiful sea in bays known to them as Bunji, Hakoda and Shimizu. The protected waters offered cod and salmon, herring and halibut. What was harvested from the sea was then processed on land, providing jobs in canneries, salteries, and reduction plants. Some craftsman founded boat works. A Japanese-Canadian community thrived along the welcoming waters of Ucluelet Inlet, where bays were named after local fishermen. Other families settled on the west coast of Vancouver Island near Tofino and Bamfield, while similar settlements could be found at Nanaimo, Chemainus, and Campbell River, as well as on the Gulf Islands. There were loggers and merchants, importers and entrepreneurs. It all disappeared so suddenly. Within weeks of the Japanese attack on Pearl Harbor, a festering political wish to remove Japanese-Canadians from the coast got official government sanction. Boats were seized, homes confiscated, neighbours exiled. Families were broken up, as able-bodied men were placed with road crews and on railroad gangs, while women and children were ordered to ghost towns in the British Columbia Interior. Four years would pass following the defeat of Japan before even those born on these shores would be allowed to return to the coast, where the homes and businesses they owned had been sold without their consent. The Second World War ended more than 65 years ago, yet some wounds remain raw and some heroes demand commemoration. On Sunday, two unrelated events in Victoria — one a lecture, the other an outdoor toast to a wartime leader — highlighted the powerful hold the war still has on some here. At the Royal BC Museum, the husband-and-wife team of Stanley and Masako Fukawa spoke about the Japanese-Canadian experience. “When I interview people who grew up in these communities before the war they did not feel objects of discrimination,” Mrs. Fukawa said before her talk. Mrs. Fukawa spent the war at Greenwood, a once-booming gold and copper mining city that had fallen on hard times. As a little girl, she wondered how her father could be a fisherman when the only water was a nearby creek. Only as an adult did she learn she had been raised at an internment camp. She worked as an educator and administrator, later playing a role in getting internment included in the curriculum for B.C. schools. At 70, she is the principal writer and editor of the Nikkei Fishermen’s Book Committee, an organization dedicated to preserving the history of those whose nets were pulled from these waters against their wishes. Her husband works as a translator for the project, which has included such books as Spirit of the Nikkei. The work has helped preserve the names of such places as Bunji Bay in Ucluelet Inlet. At about the same time as the Fukawas began their presentation, a small crowd gathered in a park a few blocks away to toast Sir Winston Churchill, the British prime minister who famously led his people in defying the Nazi hordes. In 1929, he planted a tree at Beacon Hill Park at a site known as the Mayors Grove, a meadow where dignitaries were asked to wield a spade. His visit came at a time when the ex-chancellor of the exchequer was more likely to find a favourable reception in the colonies than at home. He traveled across the Dominion, admiring Niagara Falls, attending the wheat exchange in Winnipeg, placing an Indian-rubber ball in a ceremonial face-off for the Mann Cup lacrosse championships at New Westminster. In Victoria, he spoke at a luncheon attended by 800 and toured the Esquimalt dry dock, where, a decade later, ships would be built at breakneck speed. For more than a decade, newspaper columnist Les Leyne has played host to a modest gathering to commemorate the wartime leader’s death at age 90 on Jan. 24, 1965. Once again, the author Chris Gainor reprised his role as the British Bulldog, dressing in trench coat, homburg and cigar. This being Victoria, the annual commemoration has attracted former premiers, retired cabinet ministers, and military historians. It has also attracted anonymous heroes, such as the woman whose wartime contributions included helping cracking the code of the German Enigma machine. I think that this is one of the most interesting information that I have ever read, some of the Japanese-Canadian people are so friendly for example some co/workers in xlpharmacy!